Here is a little step to. Make sure to go visit Olive Leaf Stencils and tell them Amber sent ya! You are simply amazing! The drapes look great! I'll take two in navy blue. You are too much. They look incredible. They look great!! I love the colour you chose! LOVES! I've been painting some Ikat fabric too, and its taking me FOREVER because I've been using leaky fabric dye. Need to switch back to paint. These look so good! Yes! This is the one that I got! I am so excited to get it and try it out! Wow! Very impressive- the curtains look amazing!! Absolutely beautiful!! I LOVE the paint color you chose too! oh wow, I love it! What a great idea! What a task you took on! I admit without any reservation that you did an amazing job! Will you do a full tutorial? Oh this has nothing to do with the drapes, but what is that little throw I spy on the back of the sofa? Looks like something I need to back track on your blog to read more about. You hit this one out of the park!!! I LOVE those. And I'm all about that coral-pink lately. Oh my goodness...coral ikat- delish! You are very inspiring lady. I don't care what kind of picture it is, those look fantastic! (c: That is such an awesome way to get custom curtains...bravo! i have that stencil in my "cart" but a little nervous to stencil my entry. so please tell me it was easy. i am a perfectionist so if it isn't all lined up and pretty i will go crazy. must give more details so i can commit to this thing! Way, way clever of you! I'll definitely have to give this a go! They turned out pretty damn good. I tried stenciling my stairs once, super fail. Ill leave stenciling to others. So impressed!! I agree with Mr. Goodwill..need more details. What type of paint? How long did it take, did it bleed through...They look fabulous!! brilliant Amber! Love your blog too. These look amazing! I love the color you used. Brilliant!! I love any and all ideas for hacking up some IKEA curtains. Posting this immediately. Bravo! Holy! What?! So awesome. Thanks for the how-to. I SO want to copy you!! OK from the time I left my comment yesterday, till now I have been on and off the Olive website trying to figure out what stencil to get for my curtains. You would think I was making a life or death decision here- uggg, why does one little design choice have to be so hard? Anyways, not sure why I thought I should share that with you- but maybe I just wanted to say how much I love your curtains again. Would it be a crime against humanity to paint that fireplace a glossy white? Some might say, but I don't. Oh how I love this!!! What a great way to customize your curtains! Thank you so much for this post, I feel so inspired! I just found your blog through a reader of mine who told me about your curtains. 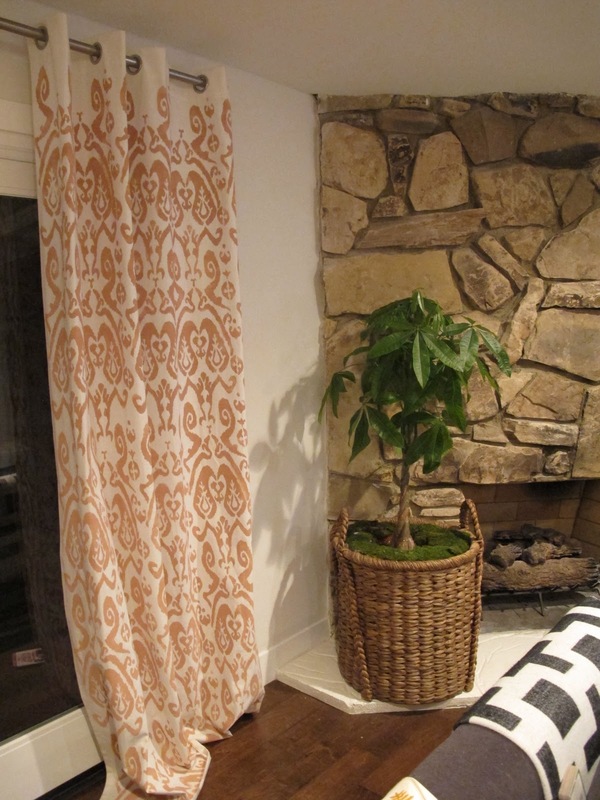 I used the ikat stencil #2 on paint drop cloths for curtains in my family room, I love Olive Leaf. 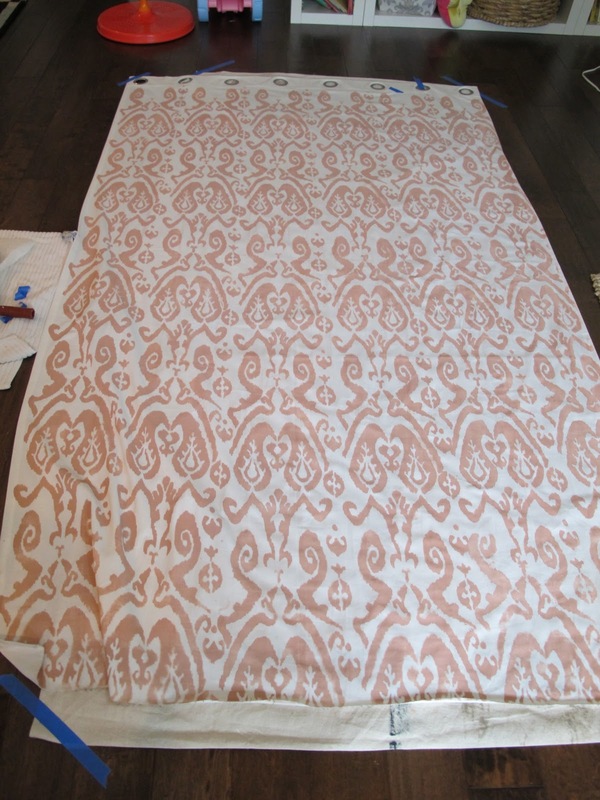 I also used this same ikat stencil you used here in my dining room - come check it out when you have chance! Have a great day - I love this color combo. Your blog is great - glad to find and follow! Great job! Two questions: What type of paint did you use? Are they machine washable? Absolutely stunning...Like the fabric and the colour you choose.